WORDS: BIOG: Moyle, Walter, Esq. In 1697 he joined with Mr. Trenchard in writing a | pamphlet entitled “An Argument, shewing that a standing Army is inconsistent with a free Government, and absolutely destructive to the constitution of the English Monarchy.” The same year, at the request of Dr. Davenant, he translated Xenophon’s “Discourse upon improving the Revenue of the State of Athens,” and sent it to him, to be annexed to his “Discourses on the public Revenues and Trade of England.” Moyle tells Davenant, in the dedication of this translation, that he “fancies it Will be no unwelcome entertainment to him, to find his own admirable observations upon these matters confirmed by the authority of one of the greatest men that ever antiquity produced, and the only ancient author upon this subject which is now extant. 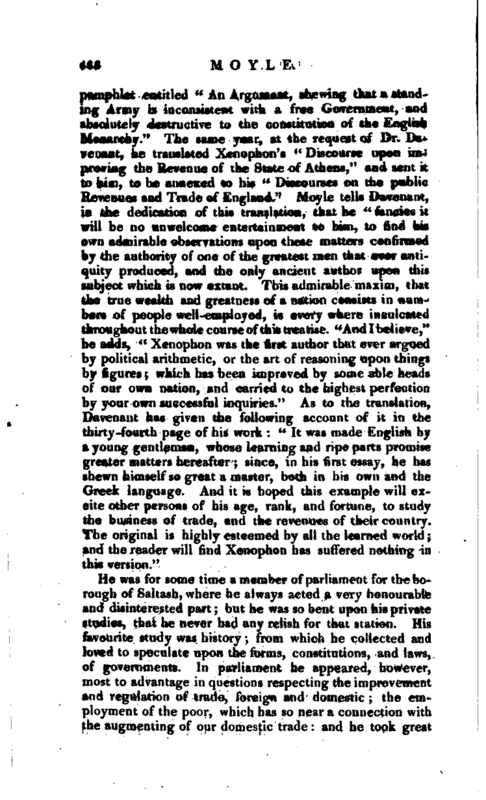 This admirable maxim, that the true wealth and greatness of a nation consists in numbers of people well-employed, is every where inculcated throughout the whole course of this treatise.” And I believe,“he adds,” Xenophon was the first author that ever argued by political arithmetic, or the art of reasoning upon things by figures; which has been improved by some able heads of our own nation, and carried to the highest perfection by your own successful inquiries.“As to the translation, Davenant has given the following account of it in the thirty-fourth page of his work:” It was made English by a young gentleman, whose learning and ripe parts promise greater matters hereafter; since, in his first essay, he has shewn himself so great a master, both in his own and the Greek language. And it is hoped this example will excite other persons of his age, rank, and fortune, to study the business of trade, and the revenues of their country. The original is highly esteemed by all the learned world; and the reader will find Xenophon has suffered nothing in this version." He was for some time a member of parliament for the borough of Saltash, where he always acted a very honourable and disinterested part; but he was so bent upon his private studies, that he never had any relish for that station. His favourite study was history; from which he collected and loved to speculate upon the forms, constitutions, and laws, of governments. In parliament he appeared, however, most to advantage in questions respecting the improvement and regulation of trade, foreign and domestic; the employment of the poor, which has so near a connection with the augmenting of our domestic trade: and he took great | patois in promoting a bill for the encouraging of seameo y and the effectual and speedy manning of the royal navy. He afterwards retired to his seat at Bake in Cornwall, where, it is said, he read all the original authors, both Greek and Latin, that is, those who wrote before the birth of Christ, and about 440 years after. From the year 440 to 1440 was a long, but dark period of time; and he aimed only to preserve a thread of the history of that middle age. The schoolmen and scholastic divinity which flourished then, be neglected; but it appears, that, in the latter part of his life, he extended his researches to ecclesiastical history. It was his custom frequently to make a review of the best systems in all sciences, being used to say, that 41 it was necessary for every man who applies himself to matters of learning, to have a general knowledge of the elements of them;" and hence he was incessantly collecting fundamental maxims, and forming divisions in all parts of learning. Early in life he contrived a scheme of so disposing books in his library, that they might give him, even by their disposition, a regular and useful view of all the several walks of learning and knowledge. In order to this, a distribution was made of them into four grand divisions; the first containing theology, the second law, the third arts and sciences, and the fourth history. He penetrated deep into all the authors he read; and he was very nice in the choice of them. An exactness of reasoning was his peculiar talent, to which was joined an uncommon vivacity of expression. He used often to regret the not having the advantage of travelling abroad; but, to make amends for this, he read the best accounts he could get of all the parts of the world, and made his reflections upon them. 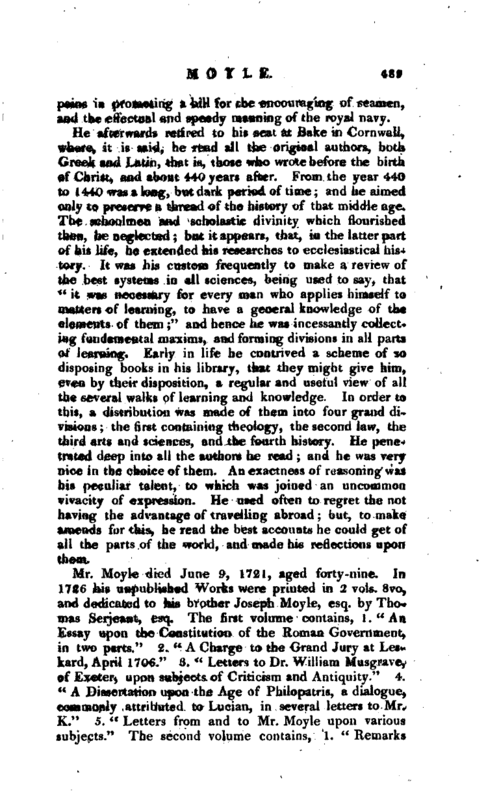 Mr. Moyle died June 9, 1721, aged forty-nine. In 1726 his unpublished Works were printed in 2 vols. 8vo, and dedicated to his brother Joseph Moyle, esq. by Thomas Serjeant, esq. The first volume contains, l.“An Essay upon the Constitution of the Roman Government, in two parts.” 2. “A Charge to the Grand Jury at Leskard, April 1706.” 3. 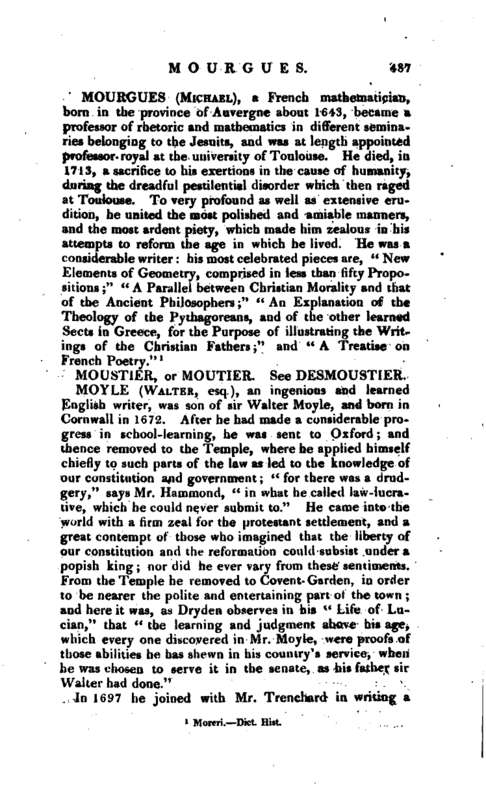 “Letters to Dr. William Musgrave, of Exeter, upon subjects of Criticism and Antiquity.” 4. “A Dissertation upon the Age of Philopatris, a dialogue, commonly attributed to Lncian, in several letters to Mr. K.” 5. “Letters from and to Mr. Moyle upon various subjects.” The second volume contains, 1. 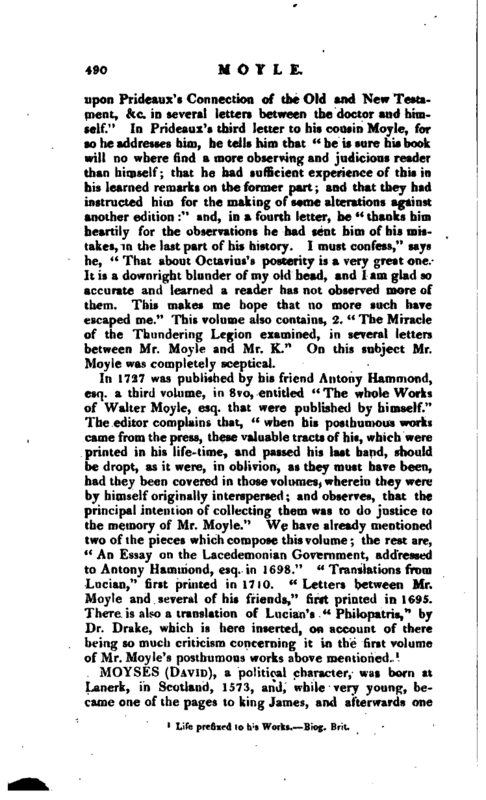 “Remarks | upon Prideaux’s Connection of the Old and New Testament, &c. in several letters between the doctor and himself.” In Prideaux’s third letter to his cousin Moyle, for so he addresses him, he tells him that “he is sure his book will no where find a more observing and judicious reader than himself; that he had sufficient experience of this in his learned remarks on the former part; and that they had instructed him for the making of seme alterations against another edition:” and, in a fourth letter, he “thanks him heartily for the observations he had sent him of his mistakes, in the last part of his history. I must confess,” says he, “That about Octavius’s posterity is a very great one. It is a downright blunder of my old head, and I am glad so accurate and learned a reader has not observed more of them. This makes me hope that no more such have escaped me.” This volume also contains, 2. “The Miracle of the Thundering Legion examined, in several letters between Mr. Moyle and Mr. K.” On this subject Mr. Moyle was completely sceptical. 1 Life prefixed to his Works. Biog. Brit.